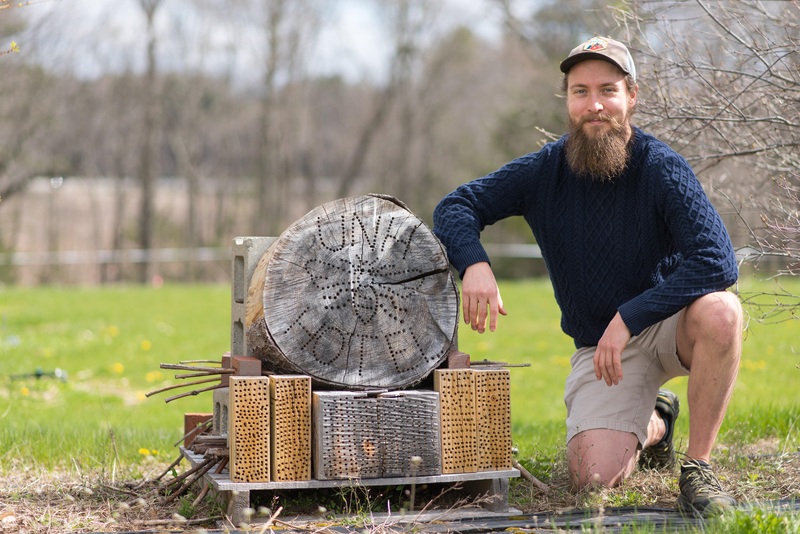 Wyatt Shell ‘20G recently won the UNH Graduate School’s 2019 Research/Scholarship/Creativity Award. The integrative and organismal doctoral candidate says he was thrilled and humbled to receive the honor. “I'm equally — if not more so — grateful to my advisor, Dr. Sandra Rehan, for the wealth of challenges and opportunities she's provided me as a young scientist,” he says. COLSA: How would you explain your discipline and/or research if you were at a party? Wyatt Shell: In my research, I get to play around in the field of sociobiology, exploring how and why some insects, such as honeybees, live life in highly social colonies. Even if you don’t really like bugs, you’re probably familiar with the basic dynamics of a beehive: a reproductive ‘queen’ lays eggs around the clock while hundreds or thousands of ‘workers’ basically do everything but reproduce (from foraging and nest guarding to caring for the young and even feeding the queen herself). Social insects (particularly ants) are quite common around the globe in part because this kind of highly social colony life has been hugely ecologically successful for them. This might initially make insect sociality seem like a biological given, but the vast majority of insects are in fact almost entirely solitary in their reproduction: they mate and lay their eggs somewhere relatively safe, and that’s pretty much that. There’s no reproductive division of labor (i.e. queens and workers), and there’s no care for, or interactions with the young. Although ants and honeybees demonstrate extreme sociality currently, their distant ancestors were solitary. My work seeks to help identify the processes that might have contributed to this gradual, evolutionary shift from solitary to highly social. I do this by studying species of “facultatively social” bees: groups which are capable of forming either a solitary nest or a relatively simple social colony. As these species have some flexibility in whether they form a solitary or social nest, they provide an opportunity to determine which behavioral, molecular, and/or environmental factors might nudge species towards or away from sociality. Shell: I’ve always loved nature, puzzles, and narratives, so participating in sociobiology research strikes a strong chord with several of my core passions at once. I believe we all innately enjoy discovering new things and communicating these findings through story. Research provides a highly immersive space for this process. COLSA: What are you most proud of? Shell: Other than having already had several opportunities to contribute to my field through publication, I’m most proud of having successfully piloted an observation nest design for one of my main study organisms, the small carpenter bee, Ceratina calcarata. Small carpenter bees excavate linear burrows inside the stems of some plants (such as raspberry or sumac). Unlike honeybees, however, C. calcarata do not readily take to non-natural nesting substrates. By collecting natural nests and carefully installing a plastic ‘window’ along a portion of the wall, however, I’ve managed to gain a glimpse of activity unfolding within the nest. This design has allowed us to capture hundreds of hours of within-nest behavior on video, the first dataset of its kind for the species, and one that will hopefully allow us to answer some questions regarding social dynamics in C. calcarata. COLSA: Why did you choose UNH? Shell: I chose UNH largely because my advisor would be Dr. Sandra Rehan. I’ve had the great fortune of getting to work with Dr. Rehan for five years now, first as a research assistant and then for my PhD. Throughout, she has provided me with a wealth of challenges and opportunities that have allowed me to continually mature and discover greater confidence as a member of the scientific community at large. I owe so much of this humbling recognition, and so much of who I’ve become as a young scientist, to her mentoring and guidance. COLSA: What do you plan to do with your degree? Shell: At this point I strongly suspect I’ll take my degree into a post-doctoral research position in sociobiology. There’s still so much we don’t know! Biological Sciences: Integrative and Organismal Biology Ph.D.